The artificial arm of a Shinobi, passed down by The Sculptor. A replica of a human arm fitted with a variety of mechanisms, apparently designed with modification in mind. While it bears a number of cuts and is stained thick with blood and oil, it has been impeccably maintained. 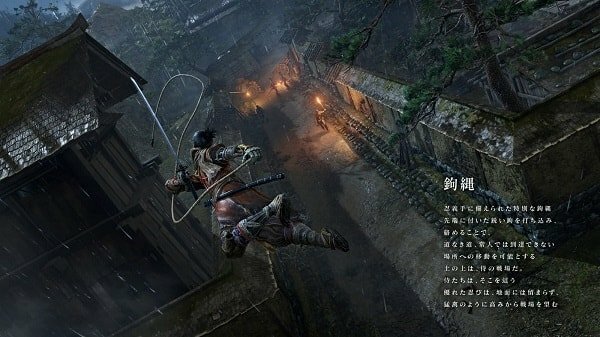 Shinobi Prosthetic is a Key Item in Sekiro: Shadows Die Twice. 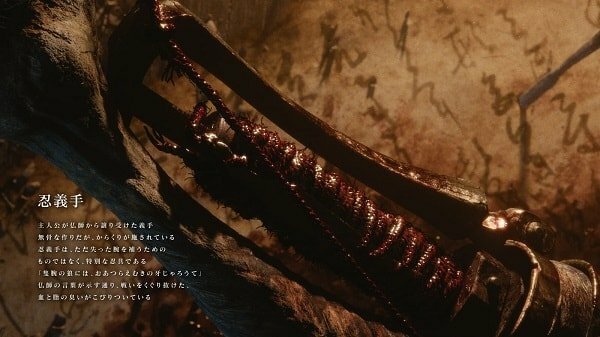 Sekiro's Prosthetic Arm is a special contraption in Sekiro: Shadows Die Twice. 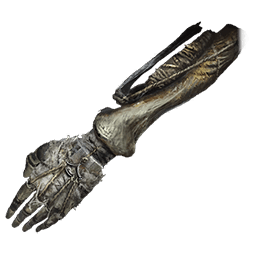 Known as the Shinobi Prosthetic, the arm was passed down by the Sculptor, and facilitates the use of several tools and weapons for the protagonist, Sekiro. 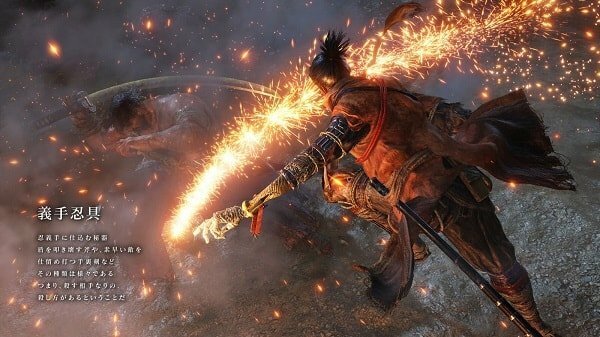 Sekiro can use the equipped prosthetic tools by using the RT / R2 button on the controller. The Grapple Hook is mapped to L2 / LT. The game allows you to have three tools equipped at any one time. You can cycle through your equipped tools by pressing Y / Triangle. There is an animation when switching so take that into account when fighting. Prosthetic Tool Upgrades - Upgrades provide access to new prosthetic effects. Skills and Skill Trees - Upgrades provide increased synergy with the prosthetic arm. Once Sekiro has encountered The Sculptor for the first time he will be given The Shinobi Prosthetic. Players can find Prosthetic Tool Upgrades and Upgrade Materials by challenging specific enemies. Remember that in this world you are the only one with the ability to use a prosthetic. This gives you an advantage over enemies and can require some thinking to figure out how best to utilise it. The abilities enabled by having the prosthetic requires Spirit Emblem to carry out. Progression to new upgrades are gated behind unique items that can be found throughout the world. A prosthetic received from Busshi of Aretera, it is a bare-bones craft but hides Karakuri, making it a special ninja hand. “Let’s make a fang worthy of Sekiro the Wolf”. Transcending the fight, the smell of blood and fat is embeeded deep within. A special grappling hook for the Ninja Prosthetic Arm. It has a sharp hook on its tip, that can pierce and entangle on your target and allow you to reach places without roads. The ground is the realm of the Samurai. Excellent Shinobi shall not be grounded, and will afford themselves the benefit of height and watch the battlefield as a bird of prey. anyone know why the arm sometimes emits smoke?